Tip: By clicking on the photo, you will go directly to the clothing piece on Etsy. This fun and dynamic, velvet V-cut, dress has a golden sequined leaves design. Jessica McClintock, the original designer, added the tulle underneath the skirt to create the bell effect. Near the lower back of the dress are three large ruffled bows. Made of nylon, rayon, and acetate, this stunning dress fits an extra small to small-sized woman. Zwzzy out of California, who presents the vintage dress can not only be found on Etsy, but can also be found on Twitter, Facebook, MySpace, and Tumblr. Photography, sculpture/3-D, painting, assemblage, clothing and furniture reconstruction and design are just some of the versatile medias which Saphoona uses to create her works of art. In this wow pair of Mary Janes, she has reconstructed the toe box of the shoe by adding hinges and plates. The plates host images of a Victorian couple wearing goggles. 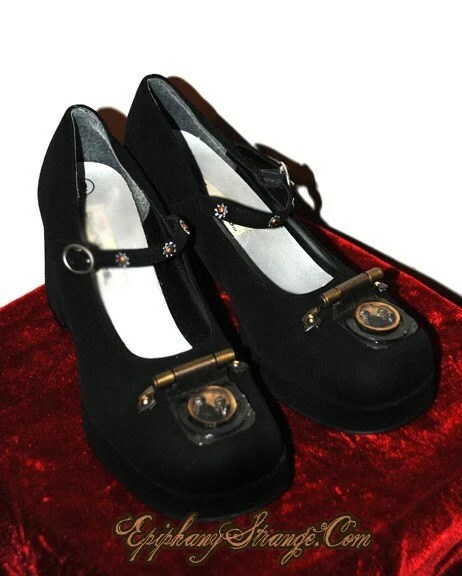 Made from a velvet suede like fabric with flowers across the instep strap, the cost of these gorgeous size 9 shoes includes U.S. shipping. For more information on Saphoona, read her profile on Etsy. Keep your hands warm, and stylish with these fun and fabulous gloves from VastlyVintage out of Florida. Made of nylon and fits a small hand, these 3/4 gloves have a pretty beaded flower design around the wrist. 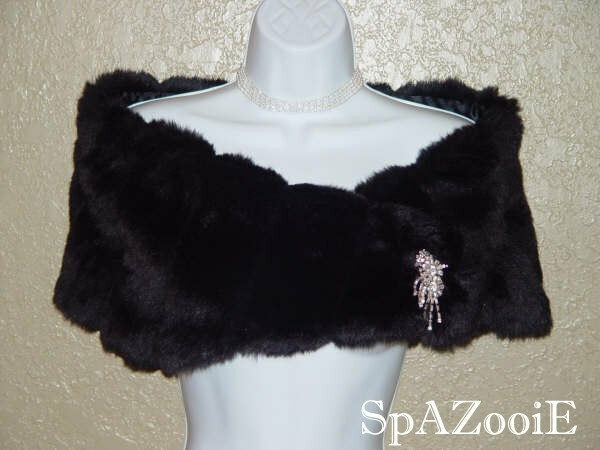 Why cover up a pretty dress with a bulky coat when you can wear a gorgeous “SpAZooiE Signature” faux fur wrap? This beauty of a wrap, made for brides…and holidays, has a satin lining and fits most sizes, including plus size lengths. While SpAZooiE of North Richland Hills closes the wrap with the beautiful brooch shown in the photo, the brooch is not included. For more available styles, shop SpAZooiE. Walking while carrying a purse, holding your mate’s hand, and, making sure your wrap stays on your shoulders is cumbersome enough. 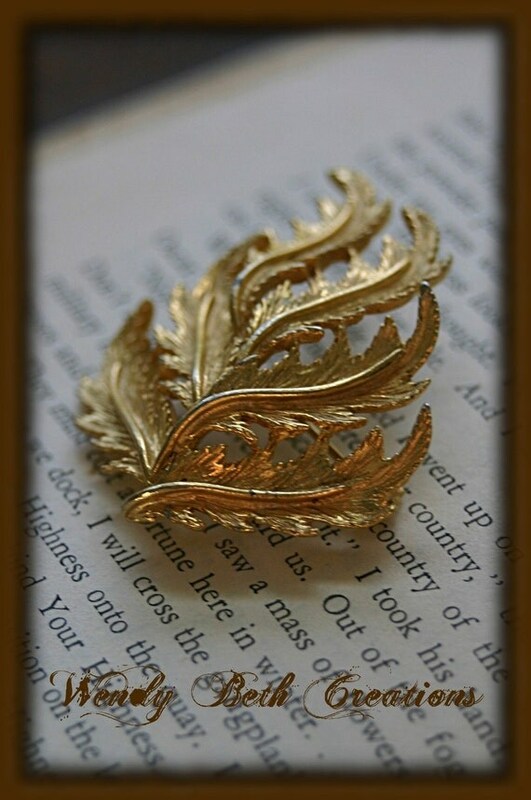 Why not free your hands by closing the wrap with this pretty fern brooch? Challenge solved. WendyBethCreations out of Michigan who presents the vintage brooch, also creates jewelry, hair adornments, and other accessories. The Set: Obsidian and Grape Hyacinth…SOLD! Be kind to your eyes, apply mineral eye make-up. Made without chemicals, this elegant Horcrux Collection includes two individual colors: Obsidian and Grape Hyacinth. Orglamix uses 100% pure organic minerals and has a 100% Guarantee of, if you don’t love the color, you’ll get your money back. With that in place how could you not try out more colors!